TheBlueGuerilla: Tatler Tory Scandal: Walker in Hot Water Over Threats Claim. Tatler Tory Scandal: Walker in Hot Water Over Threats Claim. MORE sensational allegations of threats and possible assault have rocked the Conservative Party yet again tonight, TBG can reveal. In a Facebook post Tatler Tory's reported ally Andre Walker, who was also suspended from Conservative Party conference after the suicide of 21-year old activist Elliott Johnson, says he has been accused of threatening a convicted criminal. 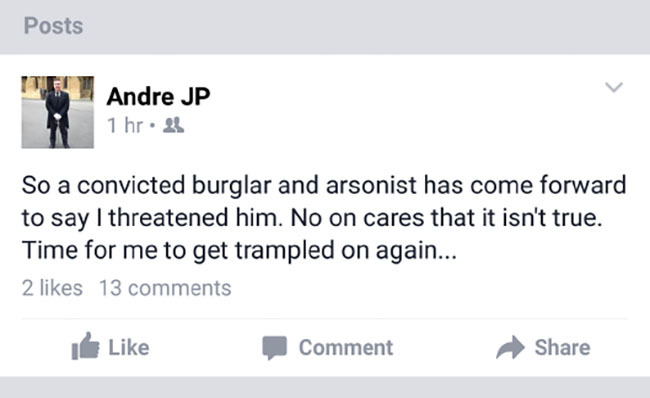 Walker says: "A convicted burglar and arsonist has come forward to say I threatened him. No one cares that it isn't true. Time for me to get trampled on again..."
TBG is yet unaware if the assault claim is linked. After CF'er Marina Muttik's story in the press yesterday sources say another Tory blonde bombshell may well be set to hit the headlines.